Michael F. Haspil is a veteran of the U.S. Air Force, where he distinguished himself as an ICBM crew commander. After retiring from the military, he served as a launch director at Cape Canaveral. He has been writing original stories for as long as he can remember and has dabbled in many genres. However, Science Fiction, Fantasy, and Horror have whispered directly to his soul. 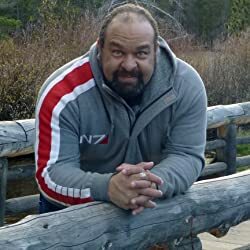 When he isn’t writing, you can find him sharing stories with his role-playing group, cosplaying, computer gaming, or collecting and creating replica movie props. Lately, he devotes the bulk of his hobby time to assembling and painting miniatures for his tabletop wargaming addiction. Graveyard Shift is his first novel. CLICK HERE FOR MORE STORIES BY MICHAEL F. HASPIL. 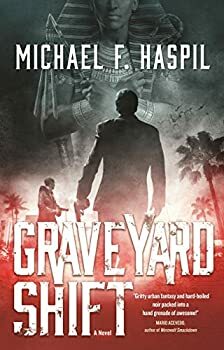 With Graveyard Shift (2017), Michael F. Haspil’s debut novel, readers who enjoy a fair amount of horror and blood mixed into their urban fantasy are in for a rare treat: the primary protagonist is a reanimated mummy, though he’s certainly no bandage-wrapped, shambling thing. Rather, he’s a sophisticated and smooth-talking detective in the sun-drenched Miami-Dade metro area, and he takes protecting his city very seriously.